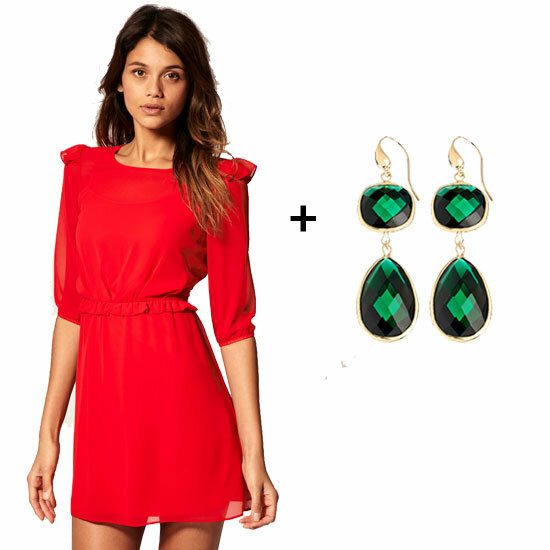 Try wearing a tint of green with a tone of red-like this lime green dress with rust-colored accessories. [And the less pieces, the better, to avoid looking matchy-matchy.] You’ll look adorable at the next holiday potluck! Or you can stick with primary red combined with a toned down green-like olive. They make a sophisticated team and will make a statement at the in-laws’ dinner table. And of course you can never go wrong with primary red. Match it with some emerald green bling and you’ll say holiday without looking like an elf. Another go is rocking around the Christmas tree in a blouse or dress with celebratory greens and reds in the print. Coordinate it with a toned sweater or blazer and neutral shoes and accessories[try metallic bronze or gold for extra spirit] and you’ll have the perfect party get-up!